Here are some photos of the ongoing line clearance, if you have any other photos please send them on and we will add them. 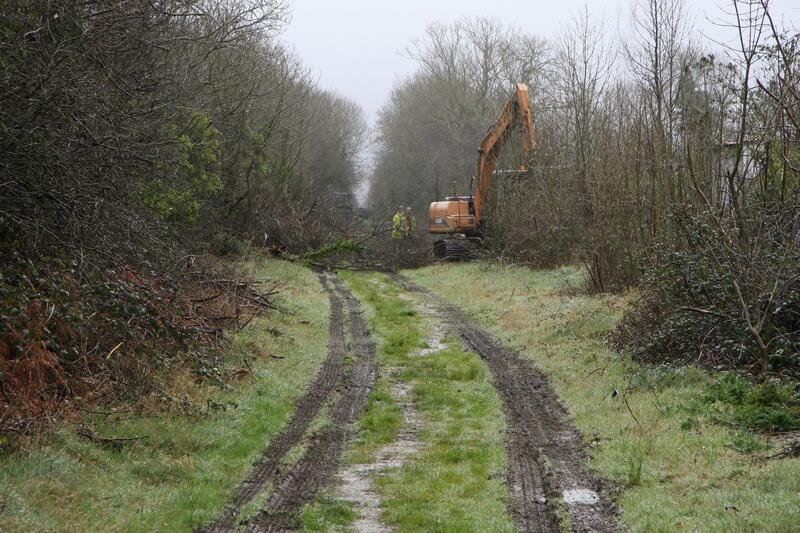 Kerry County Council have recommenced clearance works today, Friday, February 24th on a stretch of the Fenit Railway line from Rock Street to Bracker O’Regan Road, Mounthawk. The works will involve the cutting back of the trees and undergrowth, back to the railway boundary, along with the removal of rubbish and debris. The work, which is being carried out by Kerry County Council staff is expected to continue until next Friday. In some cases, the clearance works may see some residential properties along the route have their properties exposed. In these cases, Kerry County Council will be working with the owners to secure the property. “There will be some properties where the clearance works will expose their property,” a Council spokesperson stated. “Where that happens, security fencing will be immediately erected to protect their property and we will be putting more permanent boundaries in place afterwards. The clearance works will allow the Council to prepare detailed drawings and costings for works along the route relating to the proposed Tralee-Fenit walkway. “We are currently finalising a number of issues and hope to be in a position to start the Part 8 Planning Process in relation to the Rock Street to Mounthawk section of the walkway in the next few weeks,” the spokesperson said. Last week we posted a great super 8 video on the rail line from Adare to Fenit, it is worth mentioning that the majority of the Limerick section of the line [from Abbeyfeale to Rathkeale] has now been reopened as The Great Southern Trail (GST). The realisation of this Greenway was only possible thanks to the local community, state agencies, Limerick County Council and above all the trojan work of the Great Southern Trail Action Group. This has not been a short or a trouble-free journey, the Great Southern Trail Group was formed in 1991 and over the past 21 year this voluntary group has worked tirelessly to complete the 35 Km [22 mile] route that is now open. Although some parts of this route have been open for some years now it has only been in the last few month that work on 2 short sections that broke the path has been completed. 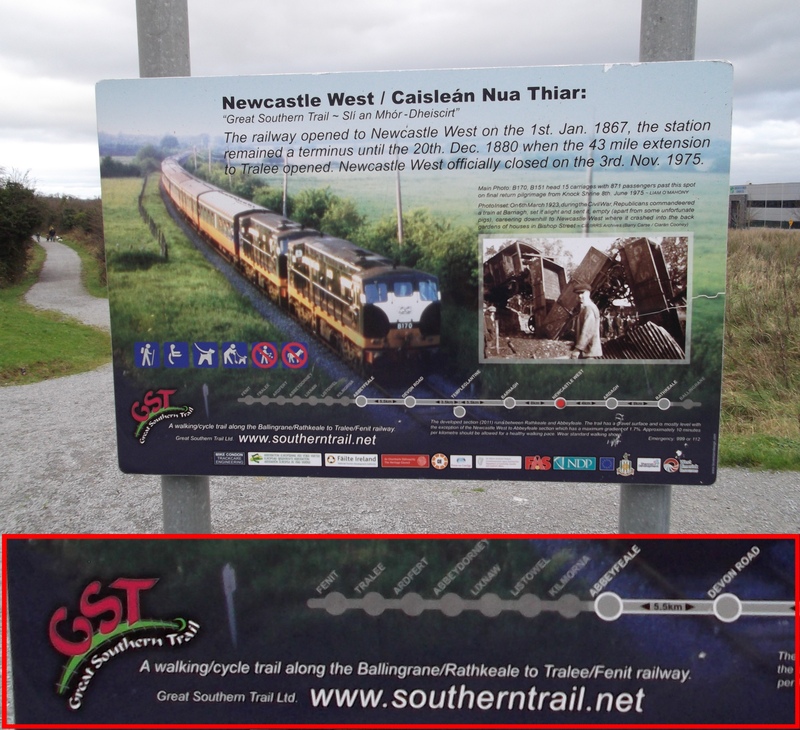 Last year the Great Southern Trail deservedly received an award from the European Greenways Association (EGWA) in recognition of the efforts made for the last 20 years by the volunteer enthusiasts of the GST who, with their tireless endeavour, have succeeded in making reality the conversion of a dissused railway line into a Greenway to be enjoyed by all. Of course the Tralee and Fenit Railway and the North Kerry Railway share the same track bed for the first couple of miles out of Tralee, meaning that that the realisation of Tralee to Fenit project would also be another piece of the Great Southern Trial completed. It would be great to see these old friends, the North Kerry and Feint routes reunited! If you are looking for a day out walking or cycleing the Great Southern Trail is highly recommended, and keep an eye out for the signage along the route which includes Tralee and Fenit ! Posted in Great Southern Trail, Tralee to Fenit Cycleway/ Walkway2 Comments on Old friends, Bookends.